Every now and then there an insight, theory, or visualisation exposes a brilliantly clear understanding of a complex situation or set of phenomena. 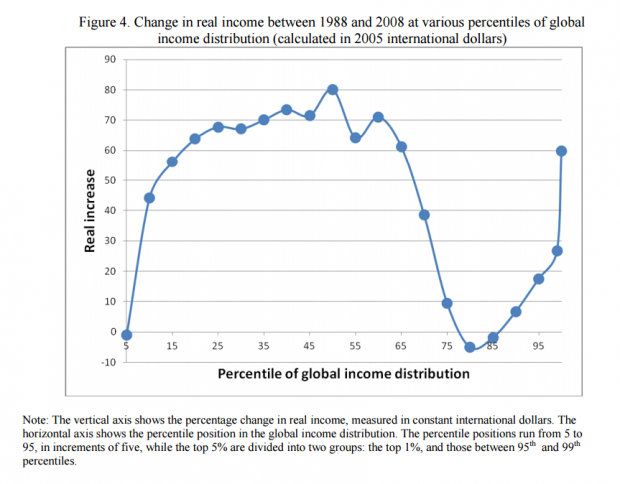 Serbian economist Branko Milanovic’s graph of the change in global income between 1988 and 2008 by percentile (called by some the “elephant graph”) is one such visualisation. This is why I, like many lefties, believe in free trade, because it is good for the majority of the world’s people (though there is still work to do for the very poorest). But it also emphasises the concerns that lefties in the rich countries have about their own countries and citizens, the benefits are not being shared fairly (wages are stagnant, many workers have lost their jobs). Many commentators (such as the two links above) believe that this explains the rising politics of discontent in rich countries, as evidenced by Brexit and Trump. Count our own Bernard Hickey firmly in this camp, as he discusses the elephant graph in this NBR audio segment (5:15). The message of the elephant graph is that the poorest of the poor must be helped, and that rich countries must share wealth more evenly. The big picture of course is that all economic activity and trade needs to be set in the context of a finite environment and the urgent requirements of reducing climate change. “Challenging” would be an understatement. What does that actually mean? In terms of actually policy how do you set economic activity and trade in context of a finite environment? Practical examples please. The amount of coal, oil is finite. The amount of energy from the the sun is more or less constant and finite. You didn’t answer my question. In terms of the things you mention Humans have no where near reached capacity in terms of overall Earth resources or in energy usage from the Sun. I’ll grant you usage of oil and coal may be reaching limits but so too was consumption of Whale oil in the 19th Century. The volatile components of our atmosphere and oceans have some severe limits on how much crap can be dropped into them without causing significant change. This includes CO2, heat, and general waste. For instance if we were able to use even a tiny fraction of the sun’s energy that drops on earth, then thereby convert it directly or indirectly to heat – we’d cook ourselves. But I never try to underestimate the levels of human ignorance and outright short sighted stupidity that you so clearly exemplify. Perhaps you should go and learn some science, and try some basic economics while you are at it. Yes I did you asked about finite!!! And heard of climate change Gossy? Humanity’s annual demand on the natural world has exceeded what the Earth can renew in a year since the 1970s. This “ecological overshoot” has continued to grow over the years, reaching a 50 per cent deficit in 2008. This means that it takes 1.5 years for the Earth to regenerate the renewable resources that people use, and absorb the CO2 waste they produce, in that same year. These are not just vague hippy theories Gosman. They’re mainstream understanding, and have been discussed by many including mainstream organisations since the 1970s. Educate yourself man. Now, now weka, you shouldn’t going round talking actual economics to people like Gosman – you’ll just confuse them and call into question their Belief in Money. Well, most resources have renewal rates. For resources referred to as “non-renewable,” those rates either genuinely don’t exist, or are so low that functionally we’re dealing with a fixed amount of resource in a human-relevant time period, such as in the case of coal or oil. Some resources have faster renewal rates, such as forestry. For resources considered “renewable,” those rates are manageable given current levels of demand, such as food, wood, wind power, or hydroelectricity. Putting economic activity in the context of a finite environment means balancing resource use against resource renewal, simultaneously meeting demand and conserving or actively renewing resources for future generations, ensuring population (and thus demand) is balanced against supply, and that resources are used effectively. (such as by recycling, eliminating planned obsolescence or through efficiency and re-use) The number of people you can afford to have for the renewal rates of your most critical resources is the “carrying capacity” of the relevant area, usually the area in discussion being a country or the planet as a whole. The planet is currently way above carrying capacity. (this is where that whole factoid came from about how if the whole world used resources like Canada did, we’d need six planets to sustain us- Canada is at over five times its carrying capacity given current resource demand) New Zealand is probably at carrying capacity or slightly above it as things stand. As Lprent has pointed out above, the other side of the coin is minimising waste and pollution, too. We can’t afford to dedicate land to dumps or trash our atmosphere if we want to maintain our current population, let alone if we’re going to continue growing. There are a lot of challenges to transforming the economy to work this way. Carbon zero is only the beginning- that covers the energy and agriculture sectors mainly. (although by extension it extends over the whole economy) There was a Green proposal or Bill at one stage, can’t remember which one, which would make businesses responsible for the entire lifecycle of their products, so if someone sold a lot of junky products that broke easily and ended up in landfills, or over-packaged their products, the businesses responsible would be liable to pay for using up landfill space. That’s an example of how you might extend that sort of principle to the retail and manufacturing sectors of the economy. Since the world was a better place in the past the target should be to reduce numbers of humans. The the past there were wars to achieve this , today it is simple birth control that is needed. The issue is a little more complicated than that. Part of the issue is that birth control isn’t the entire answer in poor countries because there’s no effective safety net for the elderly, so if you want to live a long life, you need kids to look after you, and life is risky enough that you need lots of kids. The best way to lower the birthrate is to reduce poverty, because it eliminates that incentive while naturally improving both access to birth control and education about it. But of course, lifting people out of poverty means we have to control the resource use we invest into that. Because almost every developed country is significantly over its carrying capacity in both total resource use and resource use per capita. In short, you’re damned if you do, damned if you don’t, and there are no simple solutions, we need to be smart to solve this one. A long time ago I came to the conclusion that if everybody had superanuation .old age pension … the population problem would be solved in poorer countries where having childen is their form of ‘super’. To me the obvious message is that the current economic system works, except for the extremes of both ends. If the graph was re-fashioned by population, it would show most people in the world have been pulled out of poverty. The Global top 10% got wrinsed, except for the very top 1%. Imperfect absolutely, but with results like that over the long term, who needs socialism. If it wasn’t for the socialism of working for families and the benefit there would be a lot more people on the streets in good ol inz. Plus that great free UBI we call NZ Super. Paid for by taxing the top 20%. Fully consistent with the graph. Super is a Basic Income, but it’s not a Universal one, given the age restriction. 😉 Administering said age restriction makes it a lot less effective. Pity PAYE cannot be devised to cover everybody .. it must be cruel for the self employed to see all that money being taken of them. Yes, and very costly tosociety to have civil strife, thats why green terorism has never taken off and left it to fundamentalists. No it doesn’t. Where’s ‘poverty’ on the graph? How many people who made gains weren’t poor in the first place? How many are still poor despite gains? Quite – it shows who has made gains and losses, but not where they have ended up. And it doesn’t show that those winners up on the raised trunk have got there in part at least by firing their own citizens (the ones down in the dip of the graph) and giving their work to people in developing countries who are high on the elephant’s back as a result. So to say from this that globalisation ‘works’ is quite silly because it ignores both absolute (rather than relative) outcomes. and ethics. A system that operates like the wild west can ‘work’ only haphazardly and by accident. Poverty is all over the bottom 80% or so of that graph, as it’s relative to cost of living. So people living in places where the necessities are cheap don’t need relatively high incomes, wheras if you live in New Zealand you’d do well getting by on less than $20k annually, (depending on where you live of course, obviously rural areas have less fixed costs but also make it harder to get around, and the largest three cities all have pretty high fixed costs that I’m probably judging from given my Wellington perspective) and in places like New York City your basic costs are going to be even higher and you might need to be breaking the top 90% or even 95% of global earnings to get by. 3. The degree of stability and safety enjoyed by people. It shows one measure of wellbeing and that is economic. It does not show how natural resources and livable environments can support extractive and non-sustainable industries for a long while until a final collapse. It does not show whether social structures and cohesive communities have been pulled apart, making resilience to hardships more fragile. It also does not show if protection of the most vulnerable has taken place – or if they have been relegated to the bottom of the heap on which the aspiring classes climb to get their share. (Appropriation of indigenous community land comes to mind here). Number 3 is not without importance. An increase in income without commensurate stability is a fool’s paradise. Globalisation trade makes money. No doubt. But if it is conducted without ethics, the money made usually comes with a cost for those who live where it operates, and the local environment in which it operates. The externalities are not included in graphs such as this. To me it is not so simple to state that “Free Trade” is a good thing. There is no such thing as a “Free Trade”. Do you know what the point of Trade is? Explain it to me? I am truly trying to understand right wing thinking when it comes to negative outcomes of ideological free trade ideals. No. I asked you what the point of trade is. Why do you think people within nations trade with others? Because getting stuff they want but don’t need will make them happier ? Who are you to say they don’t need it? Trade inside a nation is conducted with the same set of rules. Employment, environmental rules, similar public sector support, and the external costs are incurred in the same country. The playing field may well have bumps, but it’s nominally level. Not the same with so called ‘free trade’ between very different nations. The only thing ‘free’ about it is the absence of rules and equity between the parties involved. Which is why capitalists love it so much … so many ways to cheat and steal. Even within our our country the specious claim that all trade is good gives implicit permission for incidents like the Saudi sheep farm, failure to regulate quality and reasonable use for imported steel, etc. There is a power differential with trade, especially when one party is exceptionally wealthy and connected and the other is not. That differential is not accommodated for or considered, it is often exploited. I’m struggling to understand the cognitive dissonance of the “free trade” mind set. I can quite easily accept the negative outcomes of socialist policies for anti-social societies. Where have I ever stated there is no downside of trade? Indeed this article highlights that downside. Good comments which I should have read before posting my comment. I would like to add that apart from measuring one part of wellbeing, economics, it also only considers one economic measure, income, while ignoring other more important measures such as wealth and debt. I see globalisation as a huge wave rolling around the planet and given enough time like water it will settle down to a calm even surface. But this means government s need to work tirelessly to stop their citizens drowning as it arrives on their shores. I don’t believe this is a successful analogy for globalization as we know it. The actual process of globalization of supply chains had been already happening for at least a century before the 1980’s and does not look like what we call globalization. The free-market globalization however is not a natural force but a political movement to implement market based ‘free-market’ policies in many places. This is not to say that there were no alternatives, rather than becoming powerless nation states actively participated in de-regulation despite the alternatives. 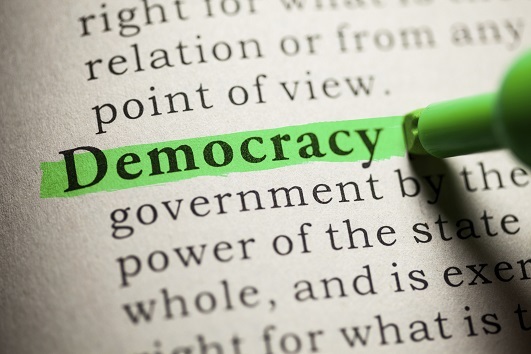 Nation states are no more or less influential than they were prior to the 1980’s (they still have sovereignty and market regulation available as options), but have opted to regulate in favour of the wealthy and powerful rather than the lower and middle classes. There were alternatives, there still are. Of course this implies that until the globalization political movement dies nation states are not going to prevent their citizens drowning but will move (and has moved) to actively water board them. That’s why i said governments have to work tirelessly etc, that we have been governed by ladder climbers instead of leaders for the last 17 years means the citizens haven’t been protected. I that if the world did more to end war and climate change like drought and focusing on disaster relief would do a lot more to end world poverty. So I think this idea that free trade which seems more about oppressing and suppressing sovereign rights and adding to pollution, climate change and war is actually doing the opposite. Tell Equador that free trade works, sarc. Tell anyone who has to clean up all the pollution and fight for generations against foreign owned companies who just use legal arguments to avoid responsibility. Meanwhile world wide biodiversity is under major threat. Instead money under the neoliberal model is used to fund war, prevent real solutions to climate change and when Scenic hotels is getting NZ funds for overseas aid building a conference centre (a right wing fantasy of equality), instead of cyclone relief or something for the poor, something is wrong…. Because the vertical axis is in % change it hides the much larger absolute changes. A few weeks ago I was working with one of these ‘middle class’ people from a developing country, the Philippines. He’s the senior in charge of running a large mine processing site for about U$2000 per month. That’s around the minimum wage in NZ. Relative to Philippine incomes he’s doing ok, but in absolute terms its still pathetic. And even if he’s doubled his purchasing power parity over 20 years, he’s still relatively poor in global terms. By contrast the very wealthy comprising the top few percent on this scale have taken already very high incomes and added to them absolute sums that far exceed the increases seen by my Filipino friend. What it also shows is assuming his relatively poor income continues to increase, eventually his income will start to become comparable to other poorer workers in developed countries … and fall into the same trough they are in. In other words there is a strict upper limit as to how much even he can benefit from globalisation. But the little slide you do there is to compare developed with under-developed country incomes. Is your example person likely to do better relative to where they are spending their income? I think that was indeed my point. In local terms our process plant supervisor is doing reasonably well. But overall he’s not well-off. For instance while I can comfortably afford to visit him and live in his country on my income, the opposite is not true. He’s never visited a developed country in his life and is unlikely to. How this trend will play out over time is an interesting question. What I’m seeing is that while developing countries are playing ‘catch up’ with the West, at some point they will hit the brick wall of our own stagnant incomes. And in global terms that still leaves most people not very well off at all, and a tiny handful hoarding vast incomes and capital beyond all economic reason or moral justification. at some point they will hit the brick wall of our own stagnant incomes. Actually Red, middle incomes in many developed Nations are not stagnant in real terms. In the US for example they have been declining for years. Hence the rush to anyone but the “establishment” figures – e.g. Trump. what is also shown is assuming our relatively good income continues to decrease, eventually will start to become comparable to other poorer workers in undeveloped countries……think the disappearing middle class in U.S. (and in slower effect other countries, including NZ). End result, a two tier world….a vast pool of relatively poor with no ability to own assets competing for less and less employment opportunities and a small super wealthy elite who own everything….hunger games anyone? This analysis is meaningless. As an economic measure, income is very narrow unless costs, wealth and debt are considered in conjunction. And then of course you have all the non-economic factors. Such studies from economists should be dismissed very smartly as the pre determined trash they are. One thing I’ve never understood, and I’m hoping someone can explain it to me, is why non-relative income is used as a measure of poverty relief at a global level. If someone earns $2/day and someone else earns $160/day, how is comparing those useful if you don’t also know the cost of living, and if you don’t know what poverty is for that particular community? I think I touched on it above. While comparing local incomes and cost of living is valid and useful … it only works if you constrain the comparison to the local context. For instance the plant supervisor I mentioned above is earning only a small fraction of what I do, yet he’s probably somewhat better off in local terms than I am. But in global terms I’m far better off. I can travel, buy assets, and do things he can only dream of. You’d probably call that “Western privilege”. I’d go beyond that financial comparison and look to such things as loss of ability to grow food – loss of community – loss of culture…. Y’know like, look at the invaluable things that can’t have a $ sign attached to them. Otherwise, the view becomes an entirely reductionist, financial one – as though that’s a legitimate, all encompassing and reasonable measure of life and value. Yes. One evening we took off to a nearby mountain village and had an evening barbecue and drinkies. We got to chatting and given he’s close to retiring within five years or so we started talking about that. On his phone he showed me a wonderful group of pics of his ‘heritage’ farmlet in the Philippines. I’d guess it was around 20 -40 acres and it looks a fine place to live. Being the tropics he can grow any amount of food (mainly tree crops) and quietly sustain himself, his family and lots of friends. It’s clearly his big project when he can stop working, and for the first time I saw him really light up. At that moment I felt both a kindred spirit and a bit envious in a nice kind of way. Yes, everyone should have a plan like that. I do. Really good story and I fully relate. It also tells me in-country comparative income is more powerful. Really not so difficult to “improve” the prospects of a piss poor person if the improvement entails shifting them from a daily income of $US1 to $US1.50…actually, it’s not improving their prospects at all if, instead of being a subsistence farmer earning next to nothing but eating, they are forced into god forsaken ‘free trade’ industrial zones to earn next to nothing with no independent access to food. But sure, percentage increases look great. How are they “forced” in to these zones? Most migration in China for example has been voluntary. People move because they think their prospects will be brighter not because they are “forced” to do so. Like maybe when those cheap maize imports flood into Mexico from the US and farmers lose income and land and wind up in the maquiladoras. Or like when urban development or major projects like dam building leads to landlessness and a need to get an income in the Shenzhen free trade zone or wherever. Or when Monsanto forces its ‘terminator’ or ’roundup ready’ seeds on Indian farmers who then wind up destitute…or dead. Most migration in China for example has been voluntary. Of course it’s voluntary, it you’re not one of millions forced to migrate internally.